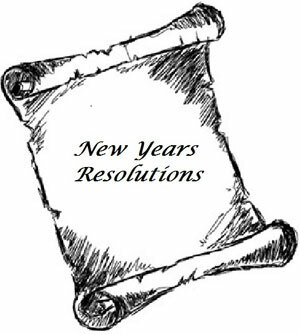 Several of our Wood News contributors sent us their New Year’s Resolutions. As inspiration (or entertainment) for the rest of us, here are 4 of the ones submitted. 1. Get better at sharpening… Merely slicing paper or shaving hair from my arm is not good enough. I want to sharpen an edge that will split molecules. A plane blade that will go through a drop of water and produce hydrogen and oxygen is my goal. 2. No inventor, I hope to at least be a modifier and create the perfect woodworking apron. I should probably also resolve to fulfill my resolutions, since this was one of my goals last year, too. 3. Either find a convenient and easy way to get glue out of my pants and shirts or be less messy when doing glue-ups. Removing the dried glue is probably a more realistic goal. 4. Re-read all of Alan Noel’s columns… I have to get better at finishing. 5. New Years resolutions should be oriented toward “self improvement.” However I want new tools. I’ll figure out how to reconcile this soon. 4. Lastly, and of course not least, I will continue to work on both my written and spoken words to hopefully better share woodworking thoughts in my articles and at our Lie-Nielsen events. I suppose this resolution will only be measurable by those who either read my articles or attend our events, so I’ll be looking to all of you for input at the end of next year. 1. I will find some good classes to go to. Highland offers a wonderful range of woodworking classes with the added advantage (for me) of no air travel, and no hotel bills since I can come back to my own house every night. In addition, I plan to look into the John Campbell Folk School https://www.folkschool.org/ just over the Georgia line in North Carolina. They offer a wonderful range of classes from a weekend to a full week on a wide variety of subjects from kaleidoscopes to quilting to calligraphy. I kinda like the fly rod stuff. Room and board are included in their fees and you stay in a dorm on site and eat family style in the dining room. To be fair, for lunch Highland points you to the saloon next door where you can eat family style with your class and quite often the instructor too. 2. I will clean the filters in my dust collectors. I looked up at the ambient air cleaner in the ceiling of the shop the other day and it must have a pound of dust in it. The filter is two inches thick and it costs upwards of thirty bucks when you buy a new one. Sure would hate to ruin it. 3. I am moving out all the plywood and pegboard that I have in the shop. I do not like plywood and I do not like things made with plywood. I had some plywood imported from Russia one time and it smelled like a wet dog whenever you cut it. Pegboard is a project killer for me. I am going to stick with real wood and concentrate on “fine” woodworking (whatever that is). 4. I will finish my sculptured rocker, the one on display at Highland. I want to rock in that bad boy and I want the right side to match the left side when I finish it. 5. I want to turn a hollow vessel. It is one of the many gaps in my turning skill set and I just think it is something I need to do well before I can rightfully call myself a woodturner. 6. Add the skew to that. Still working on that boy. 7. I plan on cleaning the shop very well at least one time this year. I will get down on my hands and knees with the shop vac and clean every square foot of the floor. I also think it may be time to throw away all those cut-offs I have been saving for heaven knows what. They tend to build up over the years, especially since I really hate to throw wood away. 8. Clamps are all over the floor. I have no good place to store them and it would be a real joy to have them in one place easily and quickly accessible to a project. I may do a cart or I may try to clean off a wall somewhere and build a wall rack. 9. My son laughs at me all the time for the roll top desk which has been about 85% finished for the last 15 years. Perhaps this is the year. Course he claims it is such a tradition seeing it there unfinished, he would really miss it if it got finished and moved up to the house. Oh yeah, there is a tilt back rolling desk chair which is only partially refinished. And the new mahogany writing table. Oh, and the oak barrister’s bookcase. The second cherry Shaker candle stand. The walnut school house clock. Plus about twenty bowls. Better be a long year. 10. I’m going to fix the work table behind the table saw. Right now, it is about four inches higher than the table saw, so if I want to use it as support when I push a board through the saw, it is too tall. (Really helpful if I ever have another piece of plywood in the shop.) Plus right now it has all those bowls and the clock on top of it in the way. I plan to clean it off, level it up and then mark the legs for cutting to the saw height. Same way you level a chair. 11. And last, I want to learn to make my own custom moldings. I find the subject fascinating, both for the detail involved, the lack of noise and dust, and the universality of the methods used. It appears that virtually any molding can be made entirely by hand and with a few of the right tools, it is achievable by most of we amateurs. Go look at “Big Pink” (don’t ask) on the blog http://musingsfrombigpink.blogspot.com/2011/11/result.html. Course he sells the tools also. 12. Oh yes, I want to learn the bass guitar. I find myself picking out the bass line in any song and in another life if I could choose, I would like to be able to sing bass in a Southern Gospel Quartet. Here’s what I mean: http://www.youtube.com/watch?v=LhAqojyHhc8&feature=related Whenever I find myself playing a little air guitar, it is always the bass line. I’ll never be able to sing it, maybe I can learn to play it. 1. Make a shop stool. I find that I am always moving my shop stool from one end of my shop to the other. This a minor inconvenience, however, it tends to break the rhythm of my work to stop and retrieve the stool. 2. Attend the annual AAW turning symposium in San Jose, CA and South West Association of Woodturners symposium in Waco, TX. I have found that national and regional symposia tend to be very inspirational. They offer a fantastic opportunity to learn from experienced turners. It is also a great way to meet and talk with turners from all over the world. 3. Successfully complete the management of the Central Texas Woodturners Association’s gallery exhibit at the Austin Bergstrom International Airport. The Austin airport is well known for its support of local business, restaurants, musicians and artists. I am very excited about this opportunity to display some of the works from central Texas wood turners. The exhibit is scheduled for the Spring of 2012. 4. Take a blacksmith class in hopes of better understanding how metals are worked into tools. WHAT ARE YOUR WOODWORKING NEW YEAR’S RESOLUTIONS FOR 2012? 1. To get my shop organized to improve my work flow and overall enjoyment of the shop. 3. Improve Dust Collection. I would like to add a couple of air filters to my shop. 5. I would like to improve my handcut dovetails, and add to my handtool collection. Finish getting a log cabin behind the house floored and build a work table in it. Have to get some lower walls fixed first.